The LSST camera's focal plane, which will capture images of millions of stars and billions of galaxies. The camera's focal plane is the area across which light from the telescope's mirrors, further corrected by the telescope's lenses, comes to a focus. As such the focal plane is the heart of the camera, responsible for capturing the light from billions of distant galaxies in a form that can be preserved. 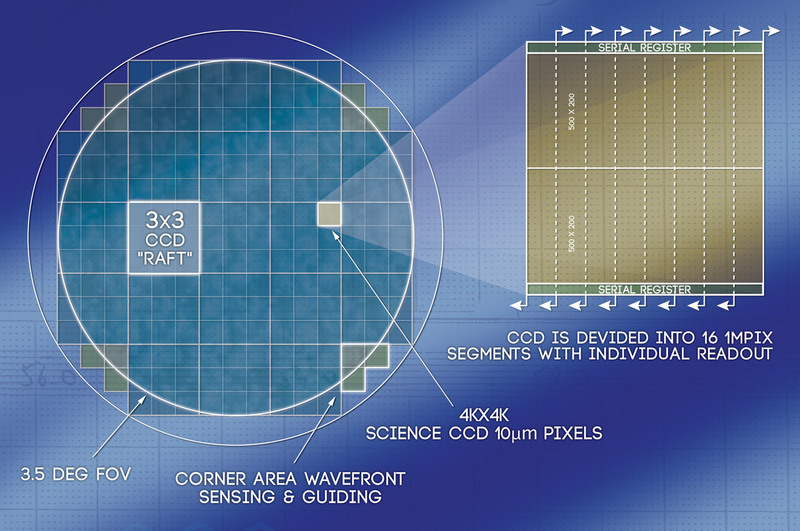 The array of charge-coupled device (CCD) sensors in the camera's focal plane operates at a temperature of approximately -100°C to achieve desired detector performance. The focal plane array is housed in an evacuated cryostat, which includes front-end electronics and thermal control for the detector array. The cryostat lens serves as both light entrance window and vacuum seal for the cryostat. Similarly, the camera body lens serves as an entrance window and gas seal for the camera housing, which is filled with dry nitrogen gas to provide an operating environment for the shutter and filter change mechanisms. The filter carousel can accommodate five filters, each 75 cm in diameter, and the filters can be swapped out robotically in two minutes or less.